Former Wales and Leicester striker Iwan Roberts believes Chris Coleman would be interested in the vacant Foxes role. 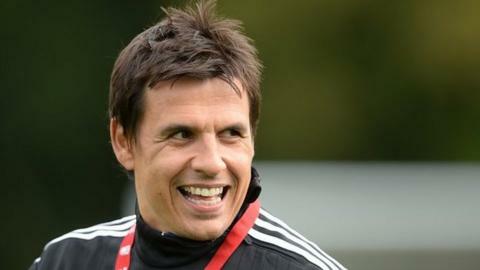 Wales boss Coleman is considering whether to remain in charge of Wales when his current deal ends in late November. The Premier League strugglers have sacked Craig Shakespeare four months after appointing him as they sit third from bottom of the table. "Would Chris be interested? I think he would," Roberts told BBC Sport Wales. "It's coming toward the end of his contract with the FAW. "He's made no secret that he wants to get back into club football, but Leicester's a good club. "I had three happy years there, very passionate fans. "They've got a great owner (Thai businessman Vichai Srivaddhanaprabha) who will back the new manager. "Of course I'd be so disappointed to see Chris Coleman leave the Welsh camp, but I could understand him going to a Premier League club." During Coleman's five-year reign Wales made history as they qualified for the 2016 European Championships in France, where they reached the semi-finals. However, hopes of reaching the 2018 World Cup finals in Russia were dashed as Wales lost 1-0 in their final qualifier to Republic of Ireland to miss out on a play-off chance. The Football Association of Wales (FAW) wants Coleman to stay, with talks expected to begin before his contract expires. Leading Wales players also want Coleman to commit to staying in charge. Michael Appleton has been appointed caretaker boss of Leicester. Their next game is at Coleman's home club, Swansea City on Saturday, 21 October. Managers who figure prominently in the betting markets to take Leicester over are Carlo Ancelotti, recently sacked by Bayern Munich, former England manager Sam Allardyce, ex-Manchester United boss David Moyes and former Crystal Palace manager Alan Pardew. Also among the potential candidates are ex-Oxford boss Appleton, who had been working as Shakespeare's assistant, Coleman and ex-Manchester City manager Roberto Mancini.